Juvena found her ticket to freedom when she acquired her motorcycle licence and bought her first Vespa scooter on her 20th birthday. Despite being vertically challenged, she also dabbled in motocross and enduro riding for a few years. The pivotal moment of a friend‘s sudden passing drove Juvena to leave the safety net of home and job in order to travel around the world. Her method of travel – riding her Vespa scooter. Solo but hardly alone and over 27 months, she eventually rode the scooter from Singapore to Europe covering 44,000km, 25 countries, including some of the most misunderstood ones. 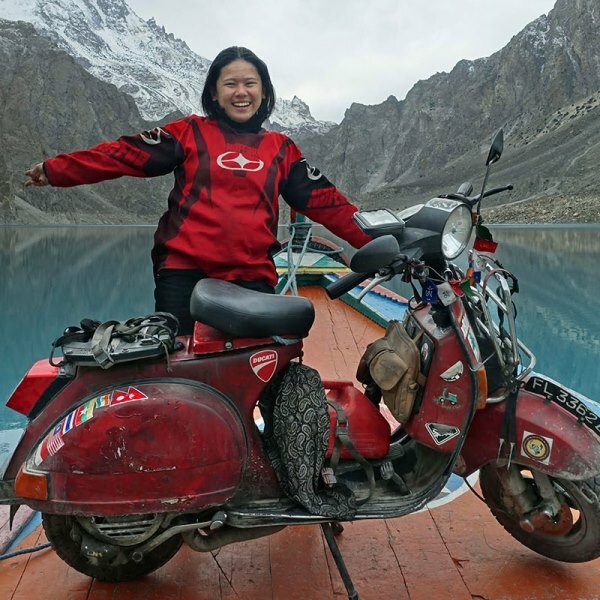 Her journey has amassed a following on the Facebook Page “The Wandering Wasp” as she shares travel stories and reveals on the ground aspects of countries hardly told by mainstream media. Juvena is currently back in Singapore for a hiatus from adventure, to work on a book and replenish travel funds. There are more places to explore and more prejudices to quell. She has plans to continue to Western Europe, Africa, and the America continents.